The Velo Select Racing Team wins again. The team had another impressive outing at the GP Cycliste de Ste-Martine on Sunday, April 26th. 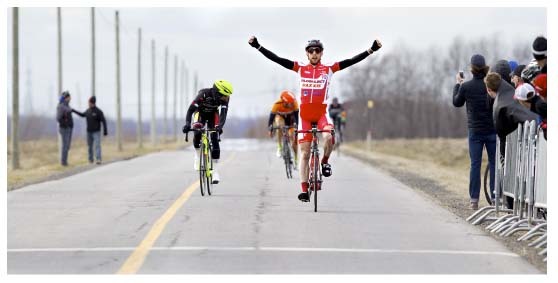 Mathieu Jeannes made it two wins in a row following his victory in Contrecoeur, Quebec, the previous Sunday. The win was due to a great overall team effort, as Cameron McPhaden and Benjamin Martel played key roles in the main breakaway leading to the victory. The Team is also proud of this win due to the calibre of riders present in the main breakaway. Remi-Pelletier Roy, Bruno Langlois, Australian Jason Lowndes, Europcar's Antoine Duchesne and Derrick St John of Silber Pro Cycling were all in the breakaway with Jeannes but couldn't contain him, as he was able to free himself in the final stretch to win by a several bike lengths over his nearest rival. The Velo Select Racing Team will be racing at the Criterium Provincial La Presentation on May 3rd, and the CLM coueur de bois Granby (Time Trial) on May 9th, plus the GP Ste Agathe/Le Nordat-St Donat . The Team plans also include getting the riders ready for the Gp Charelvoix and the UCI America Tour GP de Cycliste de Saguenay Race at the end of the month of May.